Heat oil in large skillet over medium-high heat until hot. Sprinkle steak with salt and pepper. Place steak in skillet; cook 4 to 6 minutes or until well browned, turning once. Transfer steak to 4 to 6-quart slow cooker. Top with onion and bell pepper. In same skillet, combine soup and salsa; mix well. Pour over vegetables and steak. Remove steak pieces from slow cooker; place on serving platter. Stir sauce well. Serve sauce with steak. Measure ingredients and do any slicing and chopping of ingredients the night before. In the morning, all you'll have to do is brown the steak and combine the ingredients. The night before serving the Swiss teak recipe, chill a fruit gelatin salad. 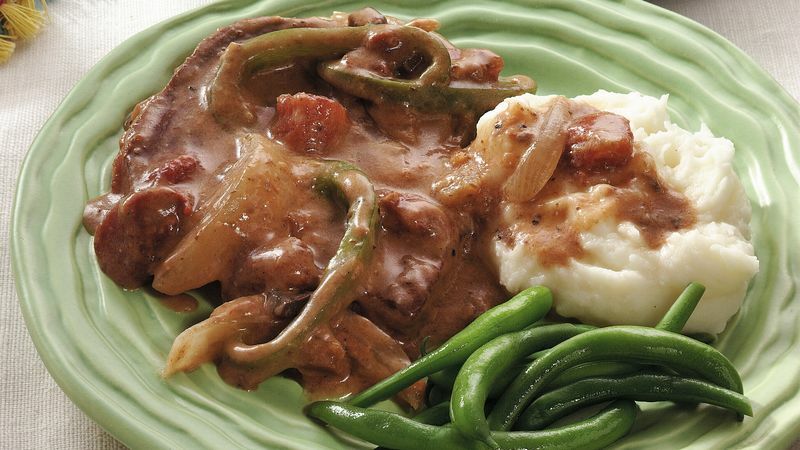 Complete the menu with Hungry Jack® Mashed Potatoes and fresh or frozen green beans.